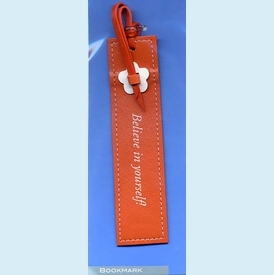 Cool leather bookmark with a white flower. It comes in two styles and it's own special quote: gerbera (large image) - "Believe in yourself!" or rose (inset) - "Follow your heart!" SIZE DIMENSIONS: ~1.125" x 4.5"